IDF continues operation to locate and capture Omar Abu Lila, the 20-year-old terrorist responsible for murdering two, wounding one. A manhunt for the terrorist responsible for a string of deadly attacks in Samaria Sunday morning continues, as Israeli forces conduct searches in Palestinian Authority-controlled villages in the Qalqilya district of western Samaria. On Tuesday, the IDF announced that it had conducted searches in the PA village of a-Zawiya in an effort to locate and capture Omar Abu Lila, the 20-year-old terrorist wanted for the murders of Gal Keidan, 19, and Rabbi Ahiad Ettinger, 47. The terrorist stabbed IDF soldier Gal Keidan at Ariel Junction on Sunday, stole his weapon, and shot him to death. In the rampage that followed, the terrorist shot and wounded Ettinger and 19-year-old IDF soldier Alexander Dvorsky west of Ariel, before fleeing in a stolen car. Ettinger later succumbed to his wounds, while Dvorsky’s condition has stabilized. 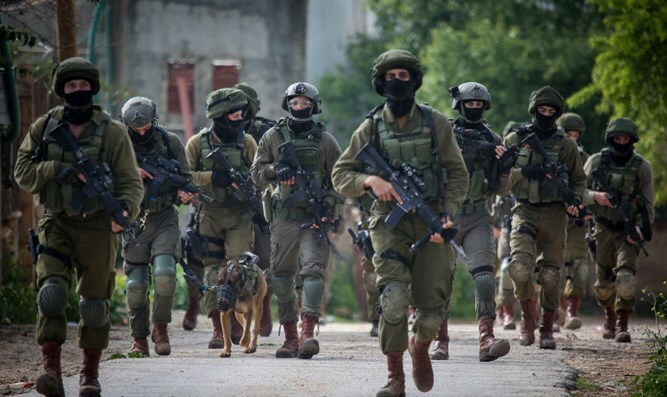 Israeli security forces also conducted searches for illegal weapons overnight, and captured 15 wanted terrorists in operations across Judea and Samaria. The terrorists were captured in joint operations of the IDF, Border Police, Shin Bet internal security agency, and Israel Police. During the security sweep in Samaria overnight, IDF and Border Police searches for illegal weapons in the Palestinian Authority-controlled city of Shechem (Nablus) and the village of Azmut, northeast of Shechem (Nablus), troops seized a Carlo-style automatic weapon, a pistol and two additional weapons. The weapons were transferred to security forces.